This is a Blue recycled plastic vest carrier bag which refers to the vest shaped appearance of the bag. It's manufactured from a high density polythene which means it's scrunchy and thin to touch, just like a supermarket carrier. 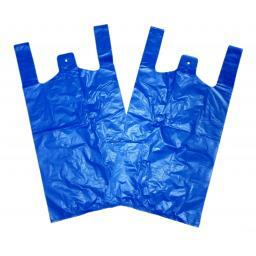 And just like a supermarket carrier, these bags are primarily designed for function over form. It's rare that you would find this type of bag in high end boutiques but you'll be sure to find them in the vast majority of high street stores.